Posted February 13, 2019 at 5:33 pm . 0 comments. 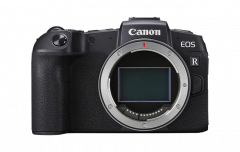 The next Canon full-frame mirrorless, the EOS RP, has been thoroughly leaked, and the product launch is expected tonight (after midnight ET). The camera is rumored to include a 26.2 mp CMOS sensor, DIGIC 8, 5 FPS, 4K recording, and weigh only 440 grams. Most excitingly, it’s expected to debut at a price of $1299, including a free mount adapter and grip. Check back at midnight ET for all the details and deals!